Hayate breaks down upon seeing Maria again. Even though it is Nagi’s dream world, Hayate demands to know why Maria left so suddenly. Maria’s response seems to come from her real self. She explains that had she stayed, Nagi would have fled to her and never come out. With that, Maria hands Hayate her resignation letter, saying that the answer about what Hayate should tell Nagi is in the letter. After asking Hayate to take care of Nagi for her, Maria tells Hayate what she wants for a birthday present. With that, Hayate races away, remembering his fateful encounter with Nagi-ojousama a year earlier. He finds Nagi in a field of flowers. Nagi thinks Hayate is the one from her dream world as Hayate makes her a crown of flowers. However, Hayate then confronts her with the truth that this is a dream world. Hayate fully explains what happened a year earlier. He thought Nagi had simply understood his situation and saved him. Thus to pay her back, he vowed to protect her with his life. Unfortunately, he didn’t realize that Nagi was in love with him. Nagi cries, not caring if this world she’s created is an illusion. Since the real Hayate is here, she demands that Hayate make a wish. To Nagi’s surprise, Hayate agrees. 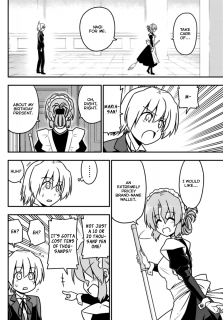 Hayate’s wish is that Nagi had never used the Royal Power. With that, the illusion is shattered and the portal home is revealed. Hayate hands Nagi Maria’s letter, which says, “Eternity is found here.” It is written on the back of the picture that Nagi had taken of herself, Maria, and Hayate. Hayate explains his reasons for his wish, not wanting Nagi to erase the good and bad times with an illusion. Despite the misunderstanding, Hayate believes the did have a real bond. Hayate tells Nagi that they have to go back. Nagi realizes that Hayate no longer has a King’s Jewel. However, Isumi grabs her before she can react and spirits her to safety. With that, the Royal Garden is destroyed and crumbles all around the trapped Hayate. 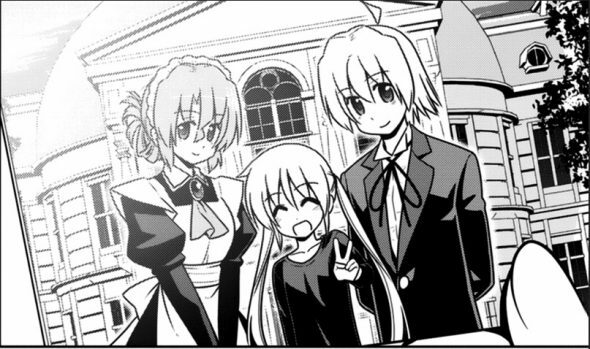 While the series has been over for a little bit in Japan, I’m finally getting around to reading Hayate the Combat Butler chapter 566. It really is a shame that Hata-sensei wasted so much time so that we have this rush to an ending. I’m 99% sure that the Maria we see here is the real Maria. For starters, her answer to Hayate is a real one, not a fantasy one. Considering this is Nagi’s fantasy, Maria shouldn’t have a real answer for Hayate. Secondly, Maria had her resignation letter handy. I liked that it was simply a note on the back of the photo that Nagi took just before the flashback arc for Athena and Hayate as kids. Finally, Maria states her demands for what she wants Hayate to buy her for her birthday. Plus, Maria states that she’ll come to get it no matter where Hayate is in the world. So, if this is the real Maria, how’d she break into Nagi’s dream realm? Well, that’s where Hata-sensei gives us readers a middle finger in a figurative sense. Actually, it is because Hata-sensei wasted so much time on gag chapters rather than focusing on plot. As such, Maria isn’t given any kind of proper end, just and end. That’s a shame. While it is sad that Nagi was forced to face reality, it is better for her to suffer the pain of reality and grow as a result. Isumi had to rescue Nagi ’cause apparently Hayate couldn’t escape out of the portal. I’m not sure why that would be, but whatever. (Something to do with not having a King’s Jewel, but one would think that an open portal could just be gone through.) While it would have been interesting for Hayate to actually have died protecting Nagi, obviously that’s never going to happen. Still, as part of shattering Nagi’s illusion, we are once again shown that Hayate never loved Nagi in a romantic sense. He always assumed that Nagi understood where he was coming from and that was the reason she took him in. So his life was dedicated to repaying her and a bond of trust and friendship was formed. As always these days, I’m behind so time to wrap this up. In the end, Hayate the Combat Butler chapter 566 continues to irritate me because it is a reminder of how much time Hata-sensei wasted instead of writing to a proper ending a couple of years ago at minimum. So while seeing Maria again is nice, we’ll never see her again.